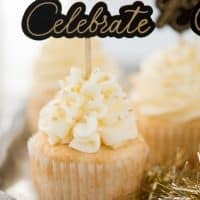 This easy champagne cupcake recipe with champagne frosting is a New Year’s Eve dessert you won’t want to miss! How to make champagne cupcakes using a box cake. We just got back from spending time with our families in Minnesota! From where we live, it’s an 8 hour drive each way. 16 hours total.. so that’s a lot of time in the car. The first 5-7 times we did that drive, Ryan and I would play various car games like the alphabet game or this weird game where whenever you pass a cow pasture the first person to say “those are my cows” gets to add a tally to their cow herd count. But, whenever you drive past a McDonald’s, the first person to spot the sign says “I killed your cows” therefore you lose a tally – whoever has the most tallies at the end of the drive wins. It is the weirdest game ever, but can become really competitive! The car games just weren’t cutting it, so when the first season of Serial was hot last Christmas, we binge listened to that on our last Christmas trip back to Minnesota. Ever since then, we rent audio books or listen to podcasts because it helps the time fly by! Since we were big fans of Serial, I found another podcast about the same case called Undisclosed: The State vs. Adan and it is SO good. Almost better than Serial. They present new evidence and go more in depth – in fact we only got through 8 episodes out of 17! They even have FAQ episodes where the answer listener questions. Now we need to find the time to listen to the remaining podcasts.. and there goes my productivity! 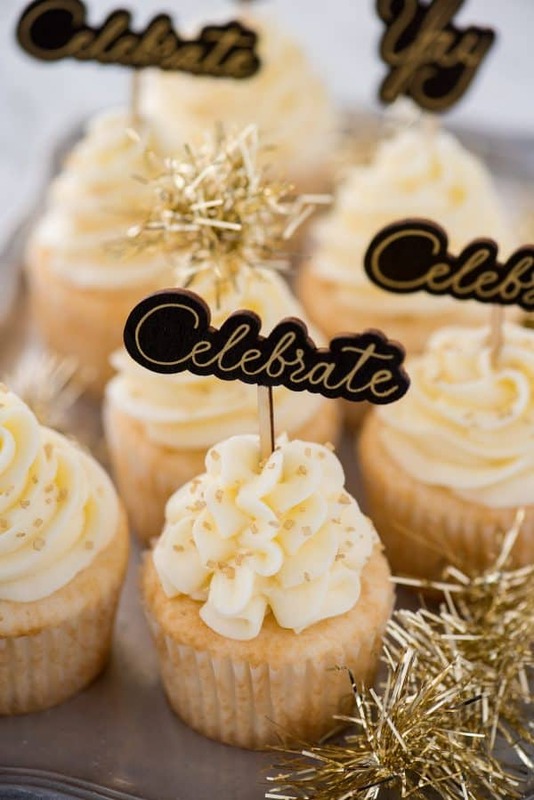 For those of you who have much more adventurous plans then me, consider taking these easy champagne cupcakes with you wherever you plan to celebrate! What do champagne cupcakes taste like? These cupcakes have a subtle champagne taste in the cake and in the frosting. They do not taste like you are drinking champagne, but have a mild champagne flavor. How to make champagne cupcakes that taste like champagne? 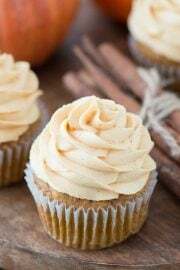 If you are wanting a really bold champagne flavor in these cupcakes, I would recommend using a champagne flavoring. Check out these ones here, here and here. You can add these “extracts” into the cake batter and into the buttercream. How to make champagne cupcakes with a box cake mix? Use your favorite box cake mix – I love and recommend Duncan Hines white cake mix. Next, follow the recipe as stated on the back of the box, BUT substitute your favorite champagne or cheap champagne for the water. That’s it! 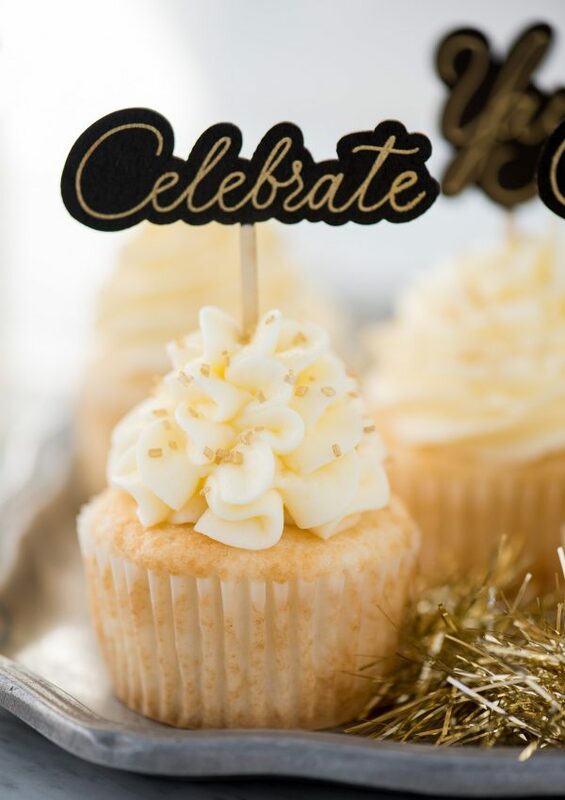 We paired these box cake champagne cupcakes with champagne buttercream. You’ll use butter, powdered sugar and a few tablespoons of champagne. 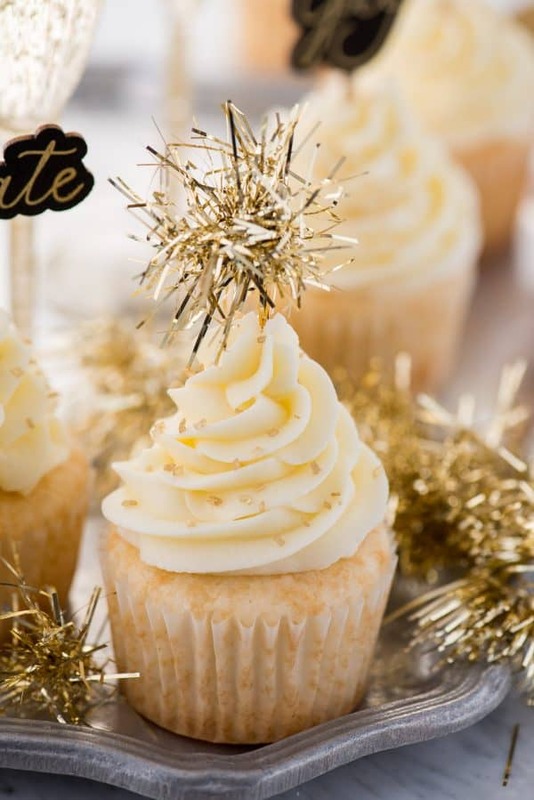 How to decorate New Year’s Eve champagne cupcakes? There are TONS of fun decorating options! 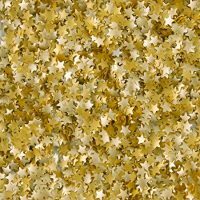 You can use gold sanding sugar, gold sprinkles, gold nonpareils, gold star sprinkles or edible gold leaf. Or you can add a cute topper. I found the “Celebrate” and “Yay” wooden toppers at Michaels. 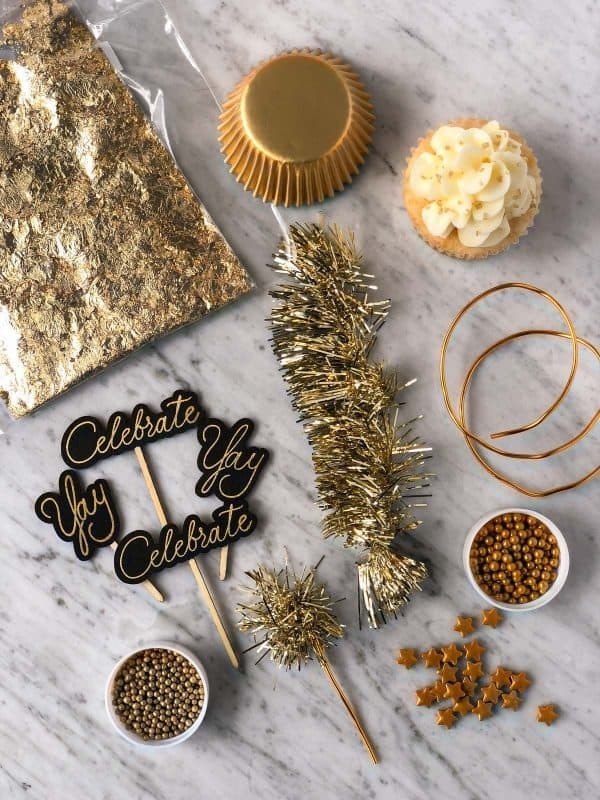 You can also make your own new year’s eve cupcake topper with gold decorating wire and gold garland, I found both at the Dollar Tree around Christmas time, leading up to NYE. To make, cut the gold wire to the desired size, and bend the wire to make a small loop on one end. Cut off a small portion of gold garland, stick it through the loop and wrap it around until it stays. You should have a little gold puff ball! This post was originally published December 2015 and updated December 2018. Preheat the oven according to the directions of the package. Prepare and bake the cake mix according to the directions on the package, however substitute the water for champagne, so if your box calls for 2/3 cup water use 2/3 cup champagne. 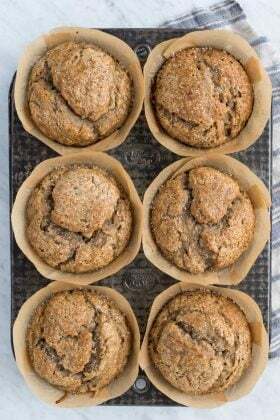 Divide the batter evenly among the muffins cups - but only fill them 1/2 full. They will puff up a lot! Bake according to the suggested time - roughly 20-25 minutes. Remove the cupcakes and place them on a cooling rack to cool. When the cupcakes are cooled, prepare the frosting. In a mixing bowl, beat the butter using an electric mixer until smooth, 1-2 minutes. Add in the champagne, starting with less and adding more for stronger flavor if desired. Begin to add the powdered sugar, about 1 cup at a time, mixing by hand first, then with the electric mixer. Continue adding powdered sugar until the frosting tastes good to you. 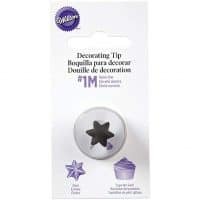 Place the frosting in a large piping bag fit with a wilton 1m piping tip. Push the buttercream down into the bag. Pipe the buttercream onto the cupcakes, starting in the center of the cupcake, swirling out, and then swirling back into the center, progressively stacking the frosting as you get to the center. Top with gold sprinkles and a cupcake topper if desired. I love audiobooks for long car rides. 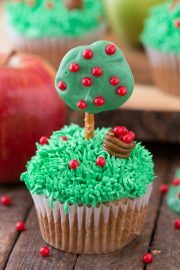 And these cupcakes look amazing. These cupcakes are simply stunning! So gorgeously perfect for NYE – seeing my daughter and I do a dessert bar to usher in the New Year! Hahaha the amount of cows we see! These cupcakes are gorgeous! LOVE the gold sprinkles! My husband and I play weird car games on long road trips too, We have to do something to help the time pass. 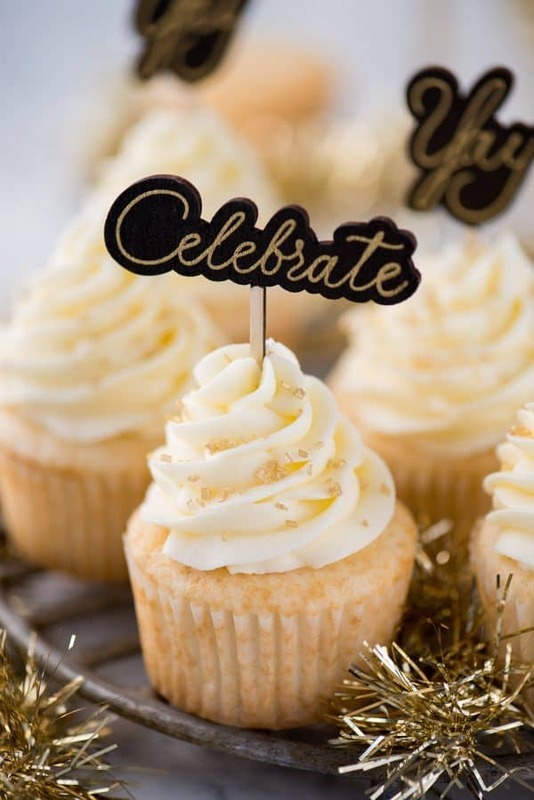 I love how you replaced the water with champagne in these cupcakes, such a great little dessert for New Year’s Eve! I don’t think these could be any cuter! I love the little bit of gold dust and sparklers! My daughter made me a pink champagne cake for my birthday and it was one of the best cakes I’ve ever had – I can only imagine how good these cupcakes are! These cupcakes are so pretty & sparkly! :) Perfect for celebrating NYE with! 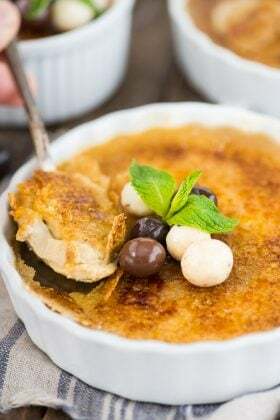 Great dessert for New Year’s celebrations! Serial was so fascinating! I haven’t had a chance to check out Undisclosed yet, but it sounds so interesting! These cupcakes, by the way, look like the perfect way to ring in the new year! I have to say made these for New Year’s Eve. 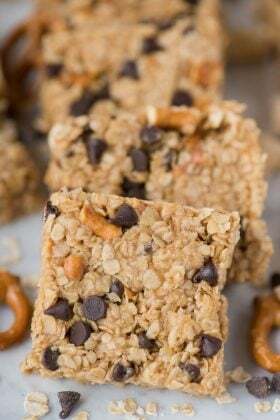 Fabulous easy recipe. A huge hit at the party. Thanks for posting recipe! These look so great! I have a birthday party I’m planning coming up and want to make these, but there will be kids and pregnant women present. Obviously with the frosting it wouldn’t, but does the alcohol cook out of the cupcakes? Hi Rachael! I am not 100% sure.. maybe steer clear? 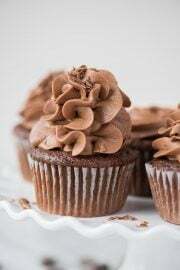 Hey, these cupcakes look stunning! what champagne did you use? I have the same question regarding what champagne (type) is used. Hi Dee Ann! I’m not a champagne expert but I used a Brut Cuvée from Barefoot Bubbly brand. Hi! How did you make the sparklers? Hi Shannon! The gold sparklers are made out of gold wire and gold tinsel! I cut the gold wire to the length I wanted, then twisted gold tinsel around the top of the wire until it stayed in place! Both of those items I found at hobby lobby. What do you do for storage? I made them and there being used tomorrow they are in a container with a lid. Will they be okay tomorrow? It will be about 9-10 hrs that they have been in the container. hi can i replace shortening to something else? You can use all butter instead. Can you substitute the champagne for a non alcoholic drink like sparkling juice? Hi Emily! Yes, you certainly can. One for one substitute! Hi Samantha! I would totally use a leftover bottle of champagne in this recipe, but that’s just me! Some readers might prefer super fresh. I noticed that it says your recipe yields 12 cupcakes but requires 1 box of white cake mix, which usually makes 24 cupcakes. Am I missing something? Hi quick question, I notice that your recipe says it makes 12 cupcakes but a standard box cake mix makes 24. Am I missing something? There is a bakery here in the Kansas called 3 Women and an Oven. They are known for their Pink Champagne cupcakes which are SO worth the drive. I may have to try these to see how they compare. Their cupcakes sound so good! The Kansas City area. I know I wrote that in the original post. I just want to be sure but, I take it the alcohol content is baked out? Hi Alexis! I can’t guarantee that all the alcohol will be baked out. If you’re looking for an alcohol free substitute try sparkling juice! Hi Beth Your blog is very nice. And the cupcake recipe you have shared is amazing. I will make this on my husband’s birthday, he will like it definitely. Thanks for sharing it. I’m so happy you enjoy the recipe and I hope your husband does too! Thank you! Thank you so much for your kind words! I hope he enjoyed it! Thank you for making us know many things about cakes..